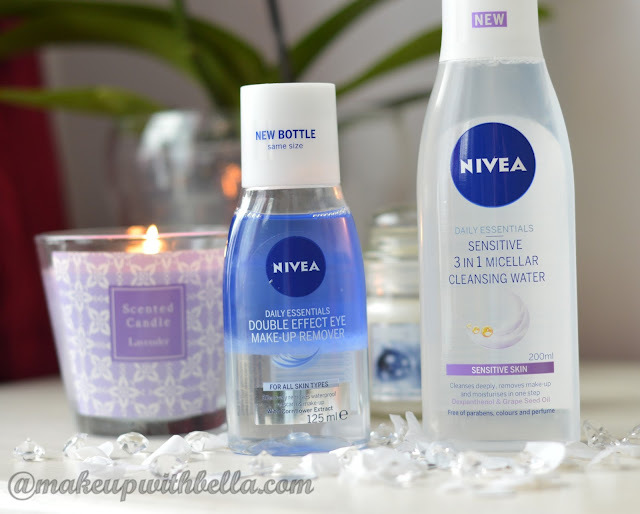 Makeup with Bella: The best cleansing micellar water in my opinion!- Nivea review! 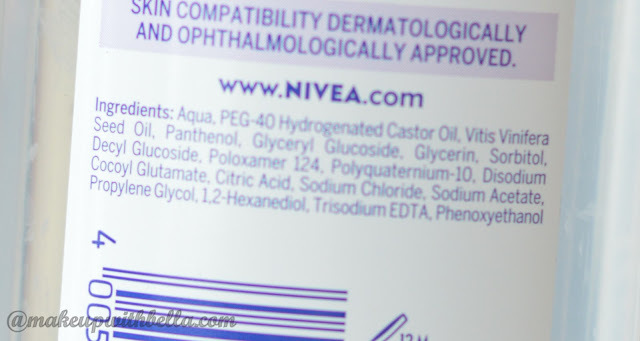 The best cleansing micellar water in my opinion!- Nivea review! I must admit that for some time I became interested in the composition of skin care products that I use and also I've analyzed composition of these two products, which today I want you to write. But I won't analyze here the whole composition, don't want to bore you. I would like to introduce you only the most important components through which those two products are effective in their action. 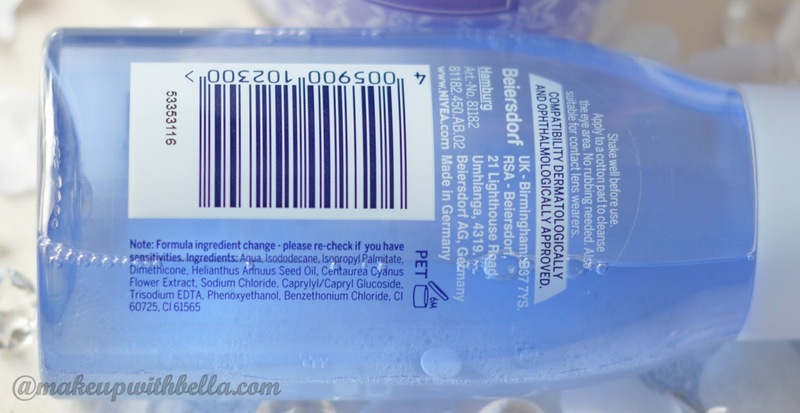 Hydrogenated Castor Oil- emollient of natural origin. It moisturizes, nourishes, smoothes and softens. It creates on the skin surface occlusive layer (film) to protect against excessive drying out. It acts as a binder. Vitis Vinifera Seed Oil, Grape seed oil, which contains mainly linoleic acid. Emollient softens and smoothes the skin, removes, among others, fatty substances. Panthenol- Anti-inflammatory and accelerates the regeneration of the skin. Lubricates and soothes inflammation. It soothes burns (including solar) and smoothes the skin. The cosmetic also plays the humectant role, which means that it prevents drying out of the cosmetic. Glyceryl Glucoside- shows revitalizing and repairing properties. Improves flexibility and smoothness of the skin. As you can see the composition is very nice. My first impression after using this cosmetic was: "Wow what a pleasant and soft feeling on the skin" compared to Garnier, which "in touch" is like a hard water. I do not know how to describe this feeling, but I think you know what I mean;). It cleanses beautifully the entire foundation from the face and even the non- waterproof cosmetics from the eyes, when the Garnier couldn't manage with this. I think it's thanks to the oil of grape seeds, which perfectly dissolves the fatty substances in cosmetics. Let's move now to Nivea Double Effect Eye Makeup Remover. Here I describe only one, the major ingredient, which is Helianthus annuus (Sunflower Seed Oil). This is the oil obtained from sunflower seeds. Sources of unsaturated fatty acids, such as vitamin E and linoleic acid. It also contains phospholipids and carotene. It does not clog pores and has anti-inflammatory and antioxidant. On the skin surface creates a film, smoothing it and regenerating. Great and easily removes all the leftovers from cosmetics without strong rubbing the eyes. Also, doesn't irritate them. I have very sensitive eyes and I couldn't find for a quite long time perfect eye remover until I've meet Nivea: no irritation, burning and tearing! 1. Nivea Sensitive 3 in 1 Cleansinh Micellar Water- available at Boots for £ 3.69, or Superdrug now for £ 2.69. You can find it in stores SAVERS too. 2. Nivea Double Effect Eye Makeup Remover- you buy at Boots for £ 3.89, or look for it in SAVERS.